I have always thought this a special place. St Mary is a little church in one of the tiny villages north-east of Halesworth. Few people even in Suffolk will have heard of it. A few houses edge the churchyard, but that's about all there is to this place. The church itself is rather squat, with an unusual roofline. The chancel is higher than the nave. We are reminded of the difference that building materials can make - just imagine St Mary without its beautiful thatched roof. A 19th century clapboard belfry surmounts the base of a tower which was never to be built; the Reformation happened first. The Norman arch to the blocked north door is still visible. The softness, the combination of thatch, flint, whitewash and wood make this, for me, one of the loveliest buildings in north-east Suffolk. There's nothing else quite like it. I have often treated myself to a visit when I have been in the area, and I have always found the church open. Coming here in the late summer of 2008, I encountered a thoughtful woman who was wandering around the graveyard with a long cane in her hand. "Have you seen any wasps?" she wondered of me. It turned out that they had been causing a nuisance, and she was looking for their nest by pushing the stick into the soft earth. Goodness knows what would have happened if she had found them. Internally, the hand of the Victorians has fallen hard. And yet, they did a wonderful job. The east end is Victorian high camp, and yet restrained, as if respectful of its elders. It was obviously intended to fit with the existing 14th century sedilia. The east wall features eight apostles on a gold background. It was restored to its original state after being blown out in the great storm of October 1987, as at Newbourn. The east window dates from that time, but there is a stunning lancet glass of Dorcas, and Mortlock credits all the 19th century work to work to William Hudson, who did a similarly fine job at nearby Sotherton. An even finer window sits at the west end of the south wall. It is a Madonna and child, surrounded by imagery from the parish. It is by Rachel Thomas, a Somerset artist. It was installed in 2001, and so is one of the first examples of 21st century stained glass work. I thought it the most stunning glass of any century that I had seen in ages. A 19th century delight is the pipe organ, which sits up in the long chancel. Everything is just as the Victorians left it. Recent repairs have exposed a fragment of wallpainting facing the south entrance. It is probably part of a St Christopher. Above it, a wingless angel gazes down mournfully, looking a bit fed up with the heating plug and socket that hems him in. In the walls of the nave, some image niches were uncovered at the same time. There are two things in particular that I love about this church. Firstly, at the west end, below where the tower would have been, you can still see the dedicatory inscription to its donors. It says Orate pro animabus, Joh'is Jewle et Marione ux' ejus (Pray for (our) souls, John Jewel and his wife Marion). They were probably a local couple, from the village, certainly not nobility. The inscription is punctuated by the symbols of a stonemason. Secondly, inside the church, above where the rood would have been, you can still make out the colours of the canopy of honour to the rood. 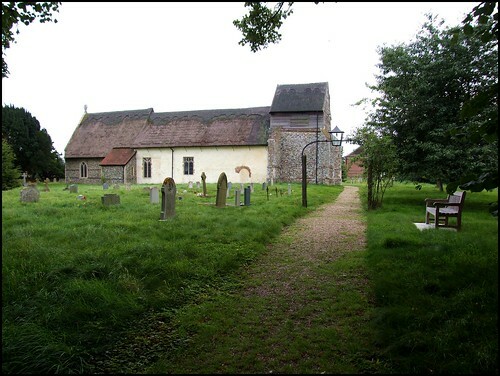 There are several others of these surviving in Suffolk, but none in such a little church. This whole church is a testimony to the liturgy and practice of late-medieval Catholicism as it was experienced in a typically tiny east Suffolk village. It is one of my favourite Suffolk churches.